Although the word ‘privilege’ was not so popular at the time I studied anthropology, I still learned a lot about ethnocentrism, racism, sexism, colonialism, discrimination, marginalization, and many other concepts related to unbalanced and unfair power relations between human groups. I learned to ask myself: what is my position in the world? D’où parles-tu ? I learned to acknowledge my prejudices, to deconstruct them, and to do my best so they would not cloud my judgment. I learned to value and cherish cultural and linguistic diversity. I got trained to listen to people’s stories and learn from them, to be empathetic. I was encouraged to make sure my work contributes to giving voice to people who have been silenced. I learned all that. I know that. Being involved with BILD/LIDA, as well as in other research projects about cultural, linguistic and religious diversity in Quebec, I came to realize something new lately. All my understanding of racism and discrimination is based on my knowledge. Linguistic or cultural diversity is for me a topic of interest. I have not myself experienced direct discrimination. I have rather experienced privilege. Even as a woman, I have been benefiting from the battles won and defended to this day by my mother and other feminists. I can’t really say that I have been discriminated based on my gender so far. It’s not that sexism doesn’t exist, on the contrary. The various denunciations of sexual harassment that have been ongoing lately are but a few examples of the patriarchy system in which we live. I did not, however, experience sexism as an obstacle to my life’s goal pursuit. So, when it comes to grasping someone else’s issues with any form or type of racism, discrimination or marginalization, I came to the realization that I don’t quite get it, as one young Muslim woman explained during her interview. So, what can I do? Well, I keep trying. I continue to educate myself about social justice and to pay attention to issues raised by different grassroots social movements in Canada and beyond, such as Black Life Matters and Idle No More. I also try to get a more personal understanding by listening to people who narrate their own experience and by reading books written by authors who identified with a cultural minority. As a lecturer, because I know I don’t quite get it, I want to avoid speaking for those who are struggling to have their voices heard. If I believe I am in a position where I can contribute to raising awareness regarding indigenous contemporary realities, for example, I do not think it is my place to speak for them. What I do is explore YouTube and other resources such as the amazing Wapikoni Mobile where I can find videos to listen to people talk about their own realities and their fight for better social justice. I listen, I reflect upon it, and I share it with my students. 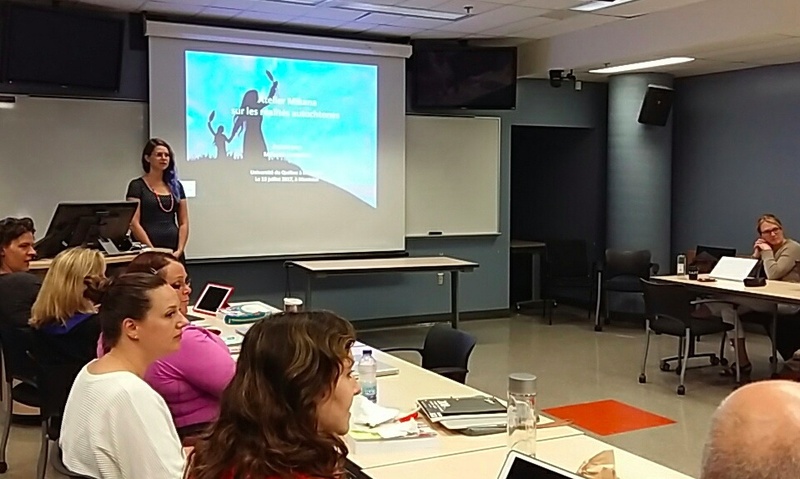 Last summer, I invited Mélanie Lumsden from Mikana to give a talk in the seminar I was teaching to help my students understand the consequences of Residential Schools on today’s Indigenous people’s lives. This was an extraordinary and powerful experience, where everyone in the classroom, including myself, had the opportunity to learn and grow. This was a first step for many of us on the path to reconciliation [Truth and Reconciliation – Commission of Canada]. To conclude, I find that research and teaching are two effective ways to stay alert about my own privileges, to push me out of my comfort zone, and to find ways to contribute to a more inclusive society, all the while trying to avoid the ‘white savior syndrome’. It may not seem much, but if I can’t quite get it, at least, I certainly try to be the best ally I can be.